You'll not find a tastier food crossword anywhere! Grab a donut or some other delicious treat, a beverage and pencil and get to work on this fun puzzle. How many delectable dishes do you know that begin with the letter D? You may or may not agree that all the ones in this puzzle are, in fact, delicious. But they do all begin with D. That's an important tip that may help you solve the most difficult clues. Can you list any words that contain 4 Ds? The words do not have to be foods. Scroll down for some possible answers. Desserts Word Scramble: A puzzle page your guests are sure to love! Be sure to have plenty of sweets to serve while your guests untangle these words! What's Cooking-Bridal Shower Game: Do your guests know all about food? Let them try this fun trivia quiz! Interesting facts will lead to some interesting discussion. Coffee Word Search - This clever puzzle is designed inside a coffee mug! Grab a cup of your favorite blend while you solve it. It's a perfect companion to the food crossword above, especially for a party or shower. Anagram Celebrity Crossword - Super-fun puzzler! Do you know whose name can be anagrammed into "I RENT BELLS?" Solve this and 21 others to successfully complete this crossword. Celebrities! Find the last name of the actor/actress who starred in each pair of films. Entertaining for you! 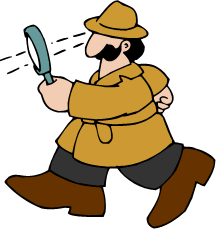 Super Sleuths - Can you deduce the names of fictional detectives, and the tools of their trade? Missing Links - Supply the word that connects both words in the clue. Example: RAW - OUT Answer: HIDE Fun to solve with your family or classmates! Possible answers include: deadheaded, granddaddy, skedaddled, diddled, and more.